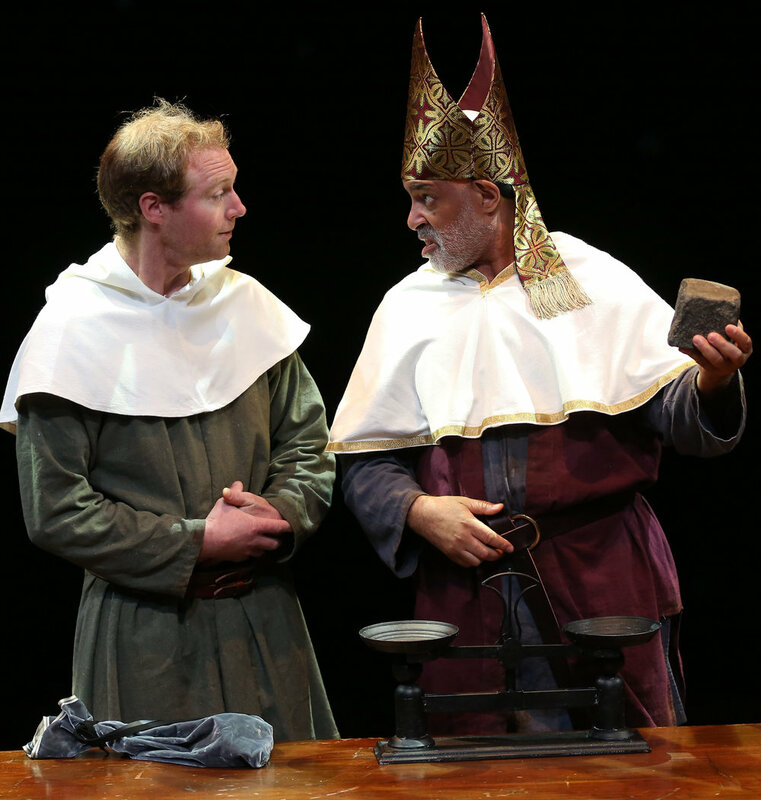 Timothy Doyle as Robert of Caistor, and Andrus Nichols as Margery Kempe wonder whether miracles can happen. Top: Nichols with Jason O'Connell as Margery's exasperated husband, John. Although uncertain about where she’s going, right away she meets a man who is selling his brewery. She immediately buys it, although it’s uncertain where she gets the money. The “brewery” is little more than a keg on wheels, but she also inherits a horse, Pegasus (played by Thomas Sommo), who is nothing like his namesake, the high-flying horse of Greek mythology. Instead, he’s a fickle beast and often won’t budge. He causes Margery no end of frustration, as his stubbornness at times leaves her stranded in the freezing cold. After a year on the road, bad living conditions and other motivations lead Margery to return home. Her beer is also a failure because it tastes awful, and she can’t promote it because she won’t give in to the advances of men to advance her sales. Margery returns home defeated, but then she gets the idea in her head to become a saint. She puts the same determination into becoming a saint as she did toward becoming a sinner. When the vicar, Robert of Caistor (Timothy Doyle), tells her she must perform a miracle to become a saint, she repeats the word over and over as if, just by saying it, she can make it happen. Somehow a miracle happens involving a stone, and the town believes she is a saint. Her mission then becomes to convince the world, and she goes on a pilgrimage to Jerusalem. Only she doesn’t have any money. Friar Bonaventura (Jason O’Donnell, who finds high comedy in the role) convinces the pilgrims, who range from a wealthy, elderly gentleman to a miserly spinster, to take her along. From left: Pippa Pearthree, LaTonya Borsay and Ginger Grace as medieval women in a pious reflection. As the play progresses, the story goes awry. The beginning is raucous, comical and highly entertaining, and Margery is an easy character to cheer for. She’s funny, ambitious, and smart. But when she embarks on her pilgrimage to Jerusalem, she becomes pitiful, annoying and one of those self-centered people you wish nothing more than to get away from. Luckily, for this production, the cast are marvelous as they play multiple roles adeptly and distinctly and keep things moving. It’s them that we come to appreciate as the script takes its turn downward. Pippa Pearthree, as Mistress Bethany Fribley, one of the pilgrims on her way to Jerusalem, invests her role with a sourness that provides a comic counterpoint to Margery’s antics. Doyle is remarkable in every role he plays and brings great pathos to his last one as the Broken-Backed man. Michael Genet, who brings depth and warmth to his roles and has a terrific singing voice as well, is also a standout. At the helm, Pendleton saves this sinking stone of a story with a light touch and wonderful staging. Pendleton is known for braving the territory of plays that have been lost or fallen into obscurity, and his love for reviving them is evident in this production. Although there are no actual set changes, the set design—by the 90-year-old playwright himself—and lighting design by Jennifer Tipton and Matthew Richards, gracefully indicate changes in time and place. Barbara Bell has successfully created medieval-inspired costumes, which have versatile panels and pieces of cloth that the actors can use as they change characters. Thomas Sommo and Michael Genet weigh the stones of the “miracle” that Margery survives. Photographs by Carol Rosegg. In the program notes, Pendleton says that he chose this play because he was “struck by its contemporaneity.” Margery’s feminist crusade is certainly contemporary. In the beginning of the story, her refusal to sleep with male customers to sell beer, for example, mirrors the way women are standing up for themselves in the #MeToo movement of today. Another feminist strand that is explored is women’s struggle with identity. Margery doesn’t want to play traditional roles, and why should she? But what mother leaves her children and considers this a feminist act? Abandoning her children for self-serving purposes is just plain neglectful, no matter how you look at it. Perhaps the politics of the 1950s, when the play was written, truly prevented Wulp from imagining a world where women had more than one identity and were capable of being empowered. There are many enjoyable moments in the play, but Margery, ultimately, is rendered a caricature, defeating the fun and strong feminist message of the beginning. In the end, she makes a mess of everything she tries to do. The Saintliness of Margery Kempe runs through Aug. 26 at the Duke on 42nd Street (229 West 42nd St., between Seventh and Eighth Avenues). Tickets are $55 to $85, and are available by calling the Duke at (646) 223-3010 or visiting www.margerykempe.com.